Our experience so far has been in (large!) lakes and within view of coast line, without any need for true navigation. We’ve needed maps for the larger lakes and to know in general where to go but never plotted a course or needed a compass. Now we want to go on bigger trips, like our main goal of going to San Juan Island in September. 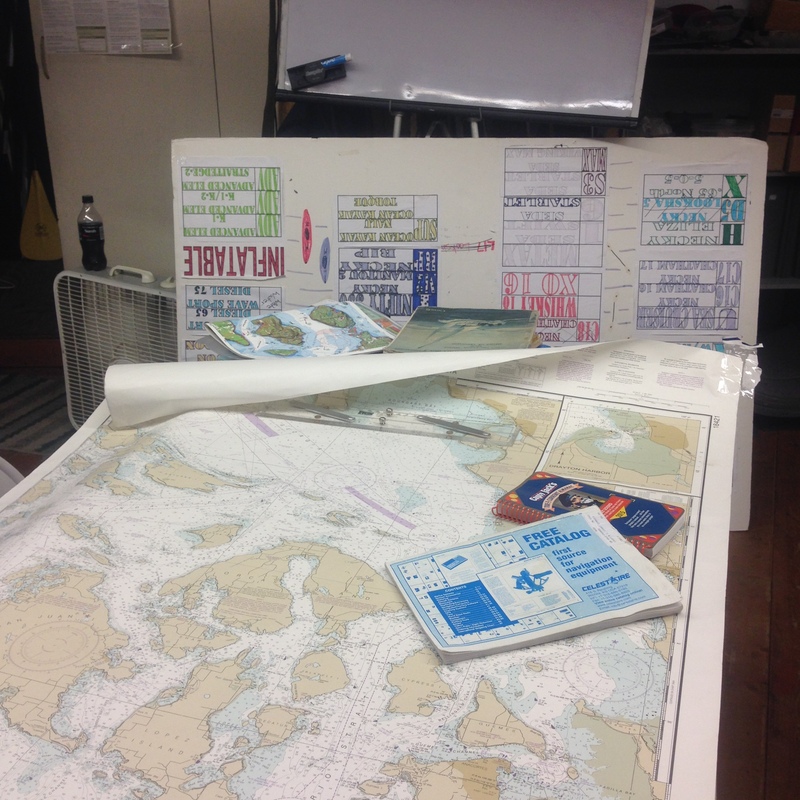 People go to the San Juans all the time, but they either go in groups where they probably don’t even realize how much planning went into the trip, or they know how to read and use a nautical chart. 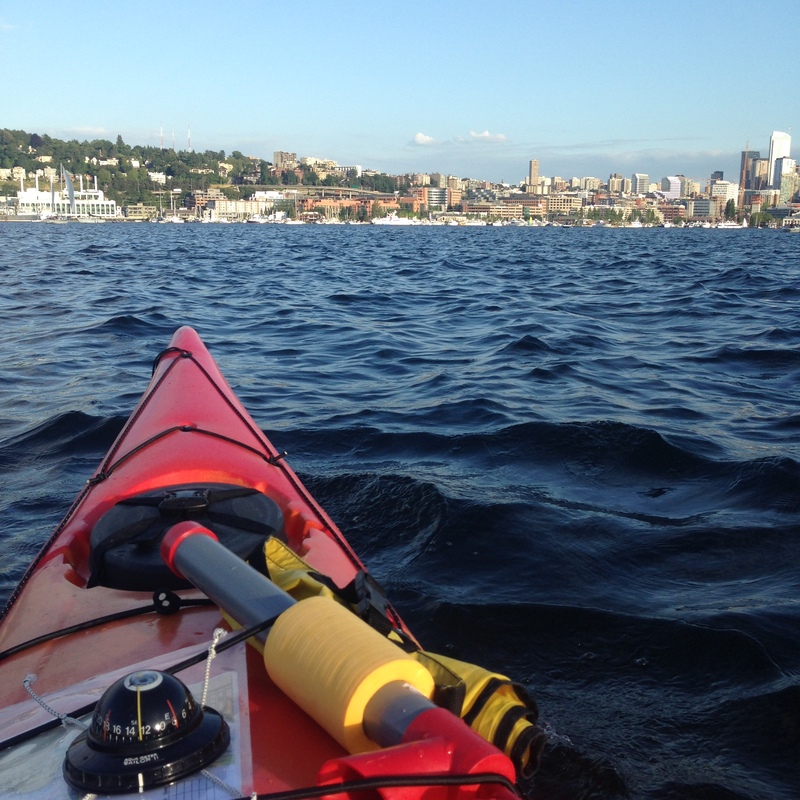 Northwest Outdoor Center, a shop and kayak/SUP rental on Lake Union, offered this class for $60/person, for a two day course (two hours each class, 6-8PM). In our class there was one instructor, John, and four students (Alex and I and another paddling couple). The other paddlers were in the same boat as us, so to speak. Some fun paddling experiences but needing more skills to transform from lake kayakers to sea kayakers. We dived right into the charts (not maps) with enthusiasm and confusion. At first the terminology and amount of information, without a real introduction to the topic, was a bit overwhelming, but not too long after we started to get it quickly (and I took a lot of notes). Since the class is only four hours total I see why jumping in is important. And as our instructor said, “it’s not rocket science”, though I’m still not completely convinced, especially after full work days. We learned about reading the depths, finding the buoys, finding the islands/landmarks while actually kayaking, deciding on the paddling path, measuring distances and angles (and how to use a compass, apparently the 13 is 130 degrees, FYI), finding the currents (with their velocities) and tide times, and ultimately planning our routes. That night I started trying to plot a very basic trip to Anderson Island that we’re doing in July to practice, and I’m glad I did before going into class the next day because it gave me a chance to ask questions, and gave me the confidence that I actually retained a lot of information. John was nice enough to start late (plus the shop was busy) because Alex was stuck in traffic heading there from work. He gave us a map with a route drawn out around Lake Union. We figured out the distances, estimated paddling times, and wrote down what our compasses should read then headed out (in their rentals. All we had to bring were clothes/water). Finding our 5 destinations (such as a red buoy) was a lot of fun. It was great paddling weather, the water was even warmer than the air, and it was like a scavenger hunt, following the clues on the map and using our compasses. At first we all (excluding John) secretly wondered if we knew how to paddle, because we kept getting pointed to the left no matter what we did. I felt like I was ten years old again at summer camp on one of those big plastic square peddle boats that only go in circles. We secretly checked our rudders to see if they had fallen down into the water and were misguiding us. All it took was one of confessing our struggles for us to realize it was the current, not us, and in fact we didn’t know how to paddle. Once we leaned and did a sweep stroke we could stay on course (mostly). Near the end of the paddle Alex had gone further and doubled back to me. We both had stupid grins on our face from being so happy to be on the water, together, successfully having completed our navigation course (pun intended). 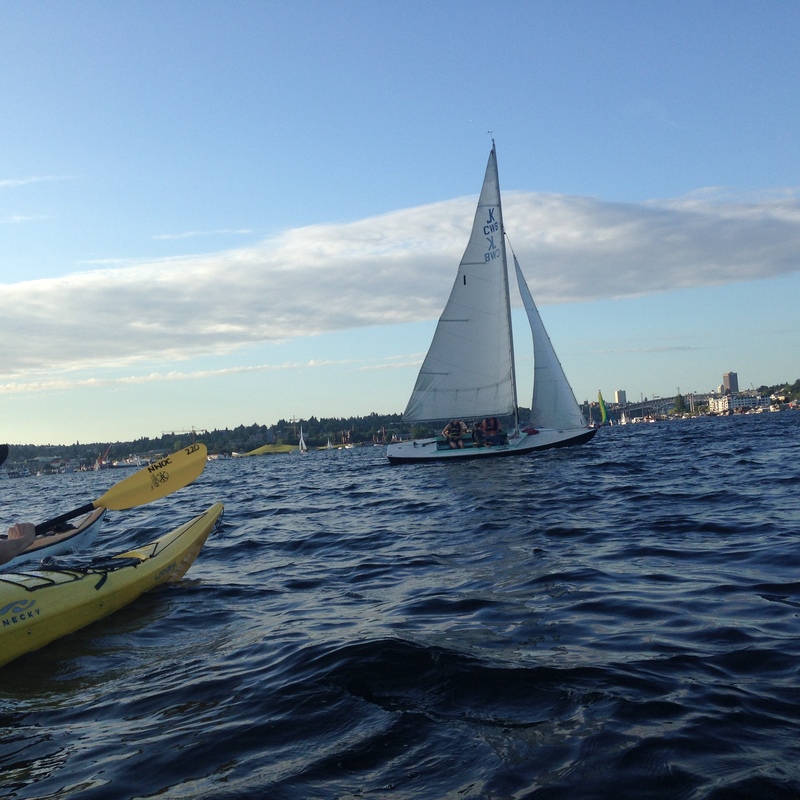 Of course, getting lost on Lake Union would have been embarrassing, but it was still an accomplishment.